Weird Crime Wednesday: The wheels on the bus stop going round and round when it gets impaled. On the morning of August 29, 2012, a school bus from Berkeley County was carrying a handful of children to one of the district's Head Start programs. 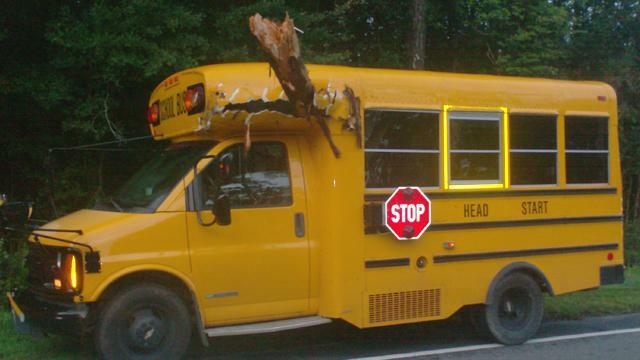 At approximately 6:45 AM, the bus was brought to an abrupt stop when a log ripped through it's top front section. After the bus pulled over (and the screaming subsided), police and medical crews were called in to check the children, the bus driver, and an assistant for possible injuries. Even though everyone seemed fine, they were still taken to the hospital as a precaution...and for what no doubt will forever be the most incredible "I GOT TO SKIP SCHOOL TODAY" story ever. Meanwhile, 69-year-old log truck driver James Roberts was arriving with a load of wood (HA!) for the nearby mill. When James got there, he noticed that one of the logs than had been on the back of his truck was missing. Hey James...it's right next to that stop sign...and a few feet away from a child's skull. He then used his powers of deductive reasoning and came to the conclusion that the bus driver simply "drove into the back of the logs" after he had turned onto the same road it was traveling. According to the Charleston Post & Courier, James Roberts was charged with making an illegal left hand turn (which I'm guessing happened right in front of the bus, which was going through an intersection at the time of the incident). Police are still gathering evidence, so more charges may be forthcoming...which may or may not include making the morning bus ride to school a crap-your-pants worthy experience (as well as an awesome story to be retold and exaggerated for years to come).